How to become a writer for TV is different than how to become a screenwriter of feature films. If you want to become a writer for TV, you have to work as a TV staff writer first. The TV staff writer, aka the “baby writer,” is the lowest rung on the ladder. From there you work your way up to story editor, co-producer, producer, supervising producer, co-executive producer, all the way up to executive producer. This typically takes a long time… and for good reason. Taking several years to climb the hierarchy in TV is necessary because you have to learn more than how to write for TV. You have to learn production as well. There’s a reason TV writers have the title of “producer.” You not only have to write, you have to write the TV show in a way that meets the immutable demands of production, and you are part of the team responsible for that production including: casting, sets, locations, props, and more. What’s Your TV Writing Goal? If you want to learn how to become a writer for TV because your goal is to write original material and be in charge of the show (aka, the executive producer or “showrunner”), you still need to start at the bottom. Film screenplays can be sold by new writers. TV pilots can only be sold by established writers. That may be disappointing to hear, but the reason it’s true is because of the production issue. Even if you write a great pilot, that doesn’t mean you have the skills to run what is essentially a multi-million dollar business with hundreds of employees and weekly deadlines. Pilot: A stand-alone episode of an original TV series used to sell the series to the network. Spec: Spec is short for speculation, and refers to when you create something for which you are not paid upfront. Specs are written with the intention of making a sale or being used as a writing sample to get paid assignments. Specs can be pilots but are more typically episodes of shows currently on the air. Important to note: pilots and specs don’t sell – they are only considered as writing samples. The next step to learning how to become a writer for TV is to create material. *Writing a screenplay for a feature film AND a spec for a TV show is my preferred method. There are two advantages to doing it this way. First, you prove you know how to write a screenplay. Second, unlike your original TV pilot, you can sell your original feature film script. 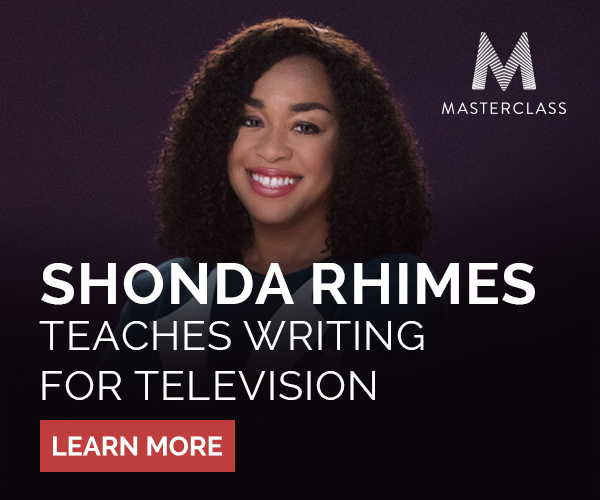 If you are looking for some guidance and insight from a top showrunner, I recommend Shonda Rhimes’s online course. Here’s my detailed review of Shonda Rhimes MasterClass in TV Writing. Ideally, a TV spec should be for an established, hit show that is currently on the air. Your job is to write an episode as if you were one of the writers on staff for that show. This shows that you can turn something around quickly, that you understand 4-act structure, and that you get what is a “typical” episode for the show. Avoid shows that have been cancelled or which are on cable. Even if you have a great idea, it’s less likely that showrunners will have seen these shows and it doesn’t prove you can turn something around quickly. You could have been writing that spec for Cheers for 20 years. Now, let’s talk about some of the less traditional routes to get hired in TV – the ones that don’t require you to write scripts. The basic idea is that you need to demonstrate outstanding work in another medium that shows your potential to add value to a team of other writers. For example, if you are incredibly funny and have a body of work to prove it from doing stand-up or writing humorous books, you can get a job working on a sit-com or variety show. Very quickly, this twitter account got a lot of notice within six months and now has more than 680K followers. Because of this, a manager reached out to Moore and helped him get an agent. Moore went through one staffing season and got hired as a staff writer on Fox’s Us & Them. Another proven path for being a TV staff writer on a comedy is coming from the world of standup. Sarah Colonna is a standup who has performed a number of comedy specials and was a semifinalist on NBC’s last comic standing. She started as a roundtable guest on Chelsea lately and in 2009 was hired full-time as a writer for the show. Louis CK is obviously a giant standup these days, but he started as a staff writer on the Chris Rock Show, Late Night with David Letterman, and The Dana Carvey Show. Larry Wilmore started out as a writer on Into the Night, In Living Color, Sister Sister, Jamie Foxx Show, and others until he did the Bernie Mac Show, became a Daily Show correspondent, and recently sold a show with Issa Rae to HBO, and as of this writing, has his own show on Comedy Central, The Nightly Show. If you haven’t already, take a look at these TV writing books. Read at least three and see what they have in common and where they disagree. While you’re doing that, think about the current hit shows you love and let ideas bubble up from your unconscious. You might hit on a great idea for a spec, a spec pilot, or a spec feature. Most importantly – take your time. Yes, as soon as you learn how to become a writer for TV, you may want to move quickly. Will you write a spec and a feature, pilot, or another spec? What shows will you spec? What stories do you really want to tell? Once you’ve answered these questions, then you can put your foot on the gas. i would like to obtain sample script materials/ manuscripts for writing for television. Here are a few recommendations for TV scripts worth reading. Hi Jamie. Glad you’re back! I do offer screenwriting classes. Here is what is currently available and I have some exciting new classes in the work as well. Stephanie…I apologize…What I am asking is the screenwriting information you provide is it a do it yourself video…or is it you giving lectures. Just wanted to be clear. I have a question: If you write a pilot for a television show, don’t you automatically become an executive producer? Or do you have to work your way up the ranks? Televisions shows are primarily developed internally and by established TV writers (and thus the showrunner receives Executive Producer credit). To get original show ideas considered, most writers already have established credits writing on other people’s shows so working your way up the ranks is essential. I love all the advice you have provided us over the years. This one is perhaps my favorite articles because it reminds people about the amount of work it *really* takes to become a tv writer. I’m sharing this with our DC Comedy Writers Group! Thanks so much for spreading the word, Wayne! Mrs. Stephnie to actually get started in the T.V. film business, I have to write for The 100 or Shameless for example, after I can start writing my own T.V. pilot, is that right? You are welcome to start writing your pilot anytime. But from a career perspective, generally it’s expected that you establish yourself as a working TV writer first before you have the clout to get meetings and be able to pitch your original ideas. How do I write TV specs if the show continues to make more episodes?? Like if I write a spec that follows from the point where a certain character is in a certain situation. Then before someone (maybe an agent) reads my spec, the show has made more episodes and has passed that point from which i wrote the spec… can you give advice on how to write a spec that wouldn’t put me in such situation? That’s a good question, Jo. The answer is to think about how to create an episode that stands alone and isn’t in the flow of the episodic story development. Sometimes, and this is just to give you an idea of how to think about this – not to tell you what to do – a spec that stands alone will use a scenario like, “The characters get caught in a snowstorm at the airport during holiday travel.” This is a scenario that could take place in a variety of places in the show’s time-stream. As another thought, you can do an episode that functions like a prequel so that you aren’t competing with potential ways in which the writers on the show are developing the work. Finally, and this is key – you need to turn around your spec quickly so that any story concepts you come up with can be executed by you before they are seen on the screen. Hello! The advice established writers give to inspiring writers is to keep writing, but what is the next step after writing that pilot, spec, and feature​? Your article entered my inbox at the right time. I am working on a comedy pilot because I was suddenly inspired to write one.The characters, dialogue, the music, storylines for future episodes were in my head begging to be put down in TV script format. So, the first draft of the pilot is done. However, I want to keep writing the next episode. After reading your article, it’s my goal to also write a spec for a current show on TV and finish up my feature. Does anyone know where I can find Issa Rae’s HBO Insecure pilot script? The reason the advice is given to “keep writing” is because it’s true and useful. You need to keep writing to improve your craft and to develop a larger library of sellable material. So… keep writing. I’ve no problem if you want to write the next episode (though I recommend outlining the entire season first…). I am a stand up who has written an original pilot for a T.V. series. I also have a bible with story lines for each character. I am sorry to hear the news about new writers not being able to sell a show but glad I found this after I wrote it, I probably would not have written it at all had I found this before and that would be sad. I am looking for someone who would be willing to work with me on this project. If I have to I will film it myself and put it on you tube but it wont be as good. Congrats on completing the pilot, Kristin. That is a success in itself and it’s smart to look for a collaborator. Stephanie, does this article also include animated television shows? I have written a spec episode of the animated series “Family Guy”. I have watched the show, learned the characters, their mannerisms and their biographies. I also downloaded a spec script of the show to learn the script format and wrote it and rewrote the script and got it copyrighted. So, long story short, I did my homework. My question is: Is it ready to send out or did I miss a specific step? Good work on doing your homework! I would have it read by some smart friends who are fans of the show and then get a professional opinion before sending it out. You want to make sure you make a good first impression. Thanks for the comment! Please email me at spalmer@goodinaroom.com and I will send you a recommendation for someone who can offer you individual guidance. Hello, my name is Marie and I have wrote and published my own book, my book is about bullying at high school that I endured when I was 13 years old , I am now 54. I am told the book is powerful and highlights the connection between bullying and mental illness. I am contacting you today to see if you would be interested in making a drama out of my book. My publishers are Authorhouse UK and my book is called…The Vile Place…(damaged by the system)…and my pen name is Niamh Conlen. The book is about my time at high school back in the 1970s in the north of England, I was bullied and assaulted by other pupils as well as teachers, as a result of my ordeal I developed OCD, depression and anxiety, the book follows my 5 years at the school and how my illness went from bad to worse and the torment of carrying out certain rituals so that nothing bad would happen to my family. I am living in a council house and I am dependant on benefits, I struggle every day financially and mentally. Would you view my book online and give me any advice or support on how to somehow get it made into a drama. I just need someone like your self to take an interest in it, the book is on most book store websites throughout the world because I have researched different websites and my book is there but it is not on shelves yet. The book tells of my Irish Catholic background and how confused and disgusted i felt about the Catholic school I attended that was meant to be a caring atmosphere but the coat of arms over the school entrance that stood for hope and kindness to one another was none existent. I wont go into any more details because the book will be self explanatory, I desperately hope that you will help me and I welcome any advice or support. Hi Marie – Thanks for your message! Please email me at spalmer@goodinaroom.com and I will send you a recommendation for someone who can offer you individual guidance on developing your book into a tv/film project. Hi, Stephanie! I have a number of books in print, non-fiction mainly, a few novels…and I would love to create television series from original ideas based on my books. Is it impossible to do this without actual TV writing experience? I have several feature scripts optioned, and one in pre-production stages, and I just wrote and produced a short film, so I have some experience writing! But in terms of breaking into television or streaming with an original series, is there a best route to take? Thank you!!! Your blogs are so wonderful! Hi Marie – Thank you for the very kind words. I’m more than happy to help in any way I can. Please email me at spalmer@goodinaroom.com and I will send you a recommendation for someone who can offer you individual guidance regarding all of your great questions.